When wishing on a falling star it is best to wish for the star to not crash into your house. Luckily, for the orphan in this animated holiday special, his lucky star landed in the mountains. 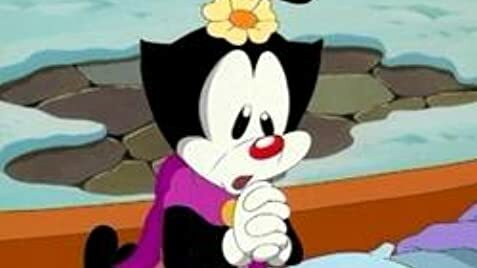 Informed by a fairy that the first to touch the fallen star receives a wish, Wakko (Jess Harnell) informs his brother Yakko (Rob Paulsen) and ailing sister Dot (Tress MacNeille), who then blab to Acme Falls about it. Needles to say, the race for the wishing star is on as the Warner siblings, the townsfolk and the King's (Paxton Whitehead) tax collector (Frank Welker) vie for their wish. A cheeky jab at holiday gluttony courtesy of Steven Spielberg's Animaniacs, Wakko's Wish seamlessly applies the series' offbeat brand of lovable lunacy, shameless lampooning and catchy musical numbers to the beloved holiday season. Executive Producer Steven Spielberg pushed for a theatrical release for this film in 1998, but Warner Bros ended up releasing it straight to video in 1999. Yakko Warner, Dot Warner, Wakko Warner: We're leaving Acme Falls to find the wishing star/ we're heading off to seek our dream come true/ It's waiting right out there/ the answer to our prayer. The hole Wakko makes falling through the bridge is gone by the time the Warners leave the bridge, and for all subsequent characters' crossings. Before the opening Warner Bros. Family Entertainment logo fades out, Wakko Warner, in tuxedo attire, walks out from behind the shield and takes a huge bite of it, much to Bugs' annoyance.